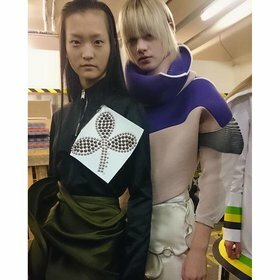 Jonathan Anderson presented his Fall 2016 collection for J.W.Anderson at London Fashion Week on Saturday afternoon. As always, the range of ideas and silhouettes was vast. This season’s showing included everything from rose-print turtlenecks to studded cargo pants to a slinky silk dress. Here, 11 things to ponder about the designer’s latest collection while you wait for Sarah Mower’s review. 1. The venue was subdivided into small rooms with white-paneled walls where guests sat in a single row. 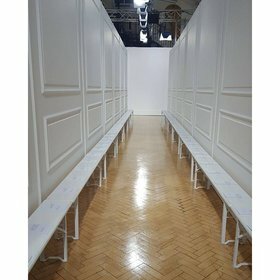 The aisles were just wide enough to permit the models to walk between the guests, giving each attendee an up-close-and-personal look at the collection. 2. 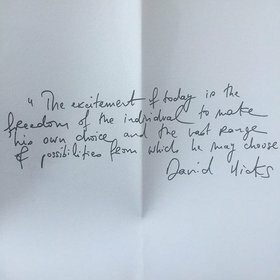 The show notes included a quote from interior designer David Hicks. 3. 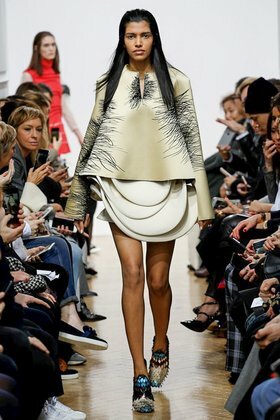 One of the more dramatic silhouettes in the collection was the pairing of an A-line top with an undulating, structured skirt comprised of different panels of fabric. 4. Many looks included tiny capelets—or were they collars?—that zipped at the neck and jutted out over models’ shoulders. 5. Yes, hoodies are trending, but leave it to Anderson to turn the idea super luxe. He sent out two full fur versions worn by Teddy Quinlivan and Kiki Willems with short miniskirts. 6. 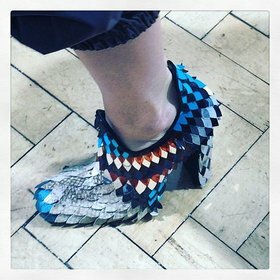 Anderson left the square-toed booties of last season behind, grounding most looks with pointed-toe boots or mules in various colors and textures. 7. 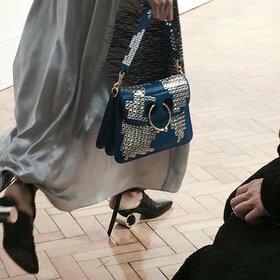 And about those mules: Each featured a cylindrical heel—and not in the way that you’d think. 8. The clouds designed for Anderson’s Pre-Fall collection were reimagined here as pieces on a zipper-trim miniskirt. 9. Giant three-leafed flowers came studded on patches that were then zipped to the fronts of blouses and track pants. 10. 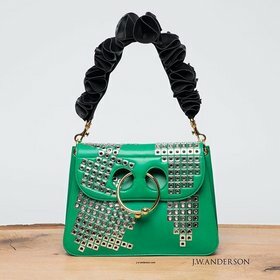 Anderson sent out new iterations of his Pierce bag, now with square grommets and ruffled straps. 11. 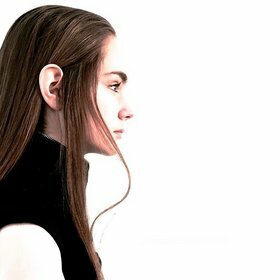 Hairstylist Anthony Turner parted models’ hair in the center and left it down, with most tucked behind their ears and a few wisps pulled forward. 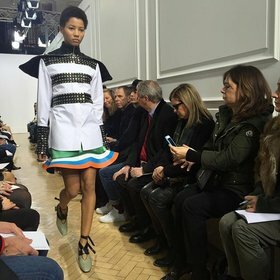 The post 11 Things to Know About J.W.Anderson’s Fall 2016 Show appeared first on Vogue.